This section describes recommended guidelines and best practices for optimal placement of the Air Unit vertical cable antennas. Avoid Obstacles between the Antennas and the Ground Unit: Place the Air Unit cable antennas as low as possible in the drone in order to avoid line of sight obstacles between the antennas and the Ground Unit while the drone is flying. Avoid Interference: Place the Air Unit cable antennas as far away as possible from other transceiver devices on the drone, especially from a transmitter in the 5 GHz band. Avoid Proximity to Metal Objects: The antennas must be at least 7 cm away from any metal object, such as the landing gear or a battery. For example, do not tie the antenna directly onto the landing gear, even if it is made of carbon. The mounting accessories provided enable you to attach the antennas while maintaining the required distance. 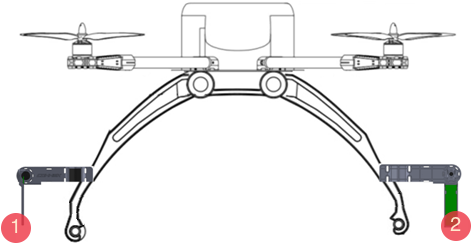 Place the Antennas so That They Are Facing Outwards: Do not place the antennas facing the inside of the drone structure. Place the Antennas so That They Are Vertical (Pointing to the Ground), but Perpendicular: The following diagram shows an optimal placement option in which both antennas are facing different directions (perpendicular), achieving a 90° angle between them. Note: To achieve optimal transmission, you must also follow the Ground Unit placement requirements described in Placement Guidelines – Ground Unit.